MEMPHIS, Tenn.--(BUSINESS WIRE)--FedEx Corp. (NYSE:FDX) announced today a development in cutting-edge delivery solutions to meet the rapidly changing needs of consumers — the FedEx SameDay Bot — an autonomous delivery device designed to help retailers make same-day and last-mile deliveries to their customers. With the bot, retailers will be able to accept orders from nearby customers and deliver them by bot directly to customers’ homes or businesses the same day. FedEx is collaborating with companies such as AutoZone, Lowe’s, Pizza Hut, Target, Walgreens and Walmart to help assess retailers’ autonomous delivery needs. On average, more than 60 percent of merchants’ customers live within three miles of a store location, demonstrating the opportunity for on-demand, hyper-local delivery. The FedEx bot is being developed in collaboration with DEKA Development & Research Corp. and its founder Dean Kamen, inventor of many life-changing technologies, including the iBot™ Personal Mobility Device and the Segway®. 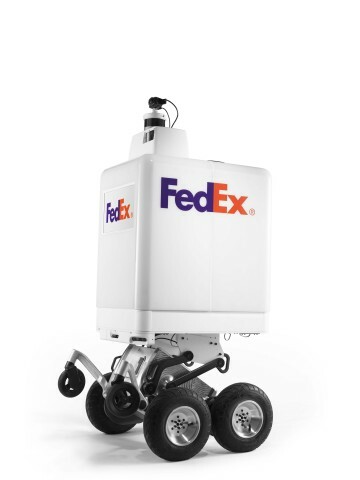 The FedEx bot is designed to travel on sidewalks and along roadsides, safely delivering smaller shipments to customers’ homes and businesses. Bot features include pedestrian-safe technology from the iBot, plus advanced technology such as LiDAR and multiple cameras, allowing the zero-emission, battery-powered bot to be aware of its surroundings. These features are coupled with machine-learning algorithms to detect and avoid obstacles, plot a safe path and allow the bot to follow road and safety rules. Proprietary technology makes the bot highly capable, allowing it to navigate unpaved surfaces, curbs, and even steps for an extraordinary door-to-door delivery experience. FedEx plans to test the bot this summer in select markets, including Memphis, Tenn., pending final city approvals. The initial test will involve deliveries between selected FedEx Office locations. FedEx Office currently offers a SameDay City service that operates in 32 markets and 1,900 cities using branded FedEx vehicles and uniformed FedEx employees. The FedEx bot will complement the FedEx SameDay City service. The FedEx bot will support retailers in several segments, and the first group of retail customers to view the prototype have recognized the value the technology can bring to their industries. “We continue to invest in new technologies and capabilities that make Target the easiest place to shop – both now and in the future. We’re excited to be collaborating with FedEx to explore how autonomous robots could enhance delivery services and more, ensuring we continue to exceed our guests’ expectations for ease and convenience,” said John Mulligan, chief operating officer, Target. The bot made its first public appearance during NBC’s The Tonight Show Starring Jimmy Fallon on Tuesday, Feb. 26. This prototype will be refined to meet safety standards and regulations, and the specific needs of customers. For more information on the FedEx SameDay Bot, please visit thefuturefedex.com. For b-roll, please click here. FedEx Corp. (NYSE:FDX) provides customers and businesses worldwide with a broad portfolio of transportation, e-commerce and business services. With annual revenues of $69 billion, the company offers integrated business applications through operating companies competing collectively and managed collaboratively, under the respected FedEx brand. Consistently ranked among the world’s most admired and trusted employers, FedEx inspires its more than 450,000 team members to remain “absolutely, positively” focused on safety, the highest ethical and professional standards and the needs of their customers and communities. To learn more about how FedEx connects people and possibilities around the world, please visit about.fedex.com. About DEKA Research & Development Corp.
Based in Manchester, NH, DEKA is a research and development company of nearly 600 employees comprised of engineering, manufacturing and quality assurance professionals focused on the development of new technologies that span a diverse set of applications. The company was founded in 1982 by Dean Kamen, an inventor who holds more than a thousand U.S. and foreign patents and numerous awards, many of them for innovative medical devices that have expanded the frontiers of healthcare worldwide. Certain statements in this press release may be considered forward-looking statements, such as management’s expectations regarding the capabilities of and efficiencies available through the FedEx SameDay Bot, and our ability to satisfy applicable safety standards and regulations and receive required government approvals. Such forward-looking statements are subject to risks, uncertainties and other factors, including inherent uncertainty that accompanies new and innovative technology, unexpected results from the initial tests, and evolving safety standards, regulations and required government approvals, which could cause actual results to differ from results expressed or implied by such forward-looking statements. Any forward-looking statement speaks only as of the date on which it is made. We do not undertake or assume any obligation to update or revise any forward-looking statement, whether as a result of new information, future events or otherwise.